April weather is excellent at Disneyland, with cloudless skies and moderate temperatures. It seems like the perfect time to go, except for one thing: spring break crowds. Also in April you can attend some fun but unofficial park events or eat yourself silly at the food festival, all of which are described below. What to expect for crowds at Disneyland in April changes every year. That's partly because of Easter which can fall anytime between March 22 and April 25. Other than that, April has no major holidays. More important, April is time for spring break. When the kids are out of school, will be so busy at Disneyland that you'll need all the strategies for reducing wait time you can muster. The rest of the month, crowds will be more manageable especially in the middle of the week. To see this year's crowd predictions, use the handy calendar at IsItPacked.com. If you can go toward the end of the month, you'll find the parks delightfully uncrowded. 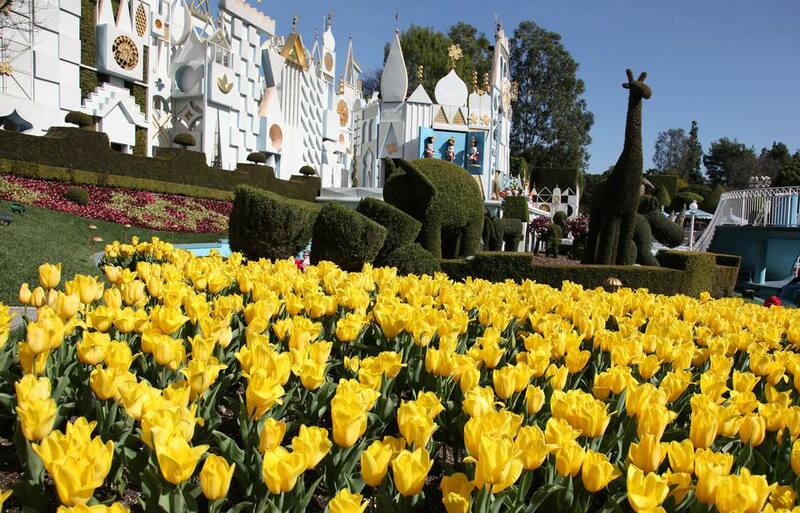 Otherwise, if you want to visit Disneyland in spring and your schedule is flexible, the best thing to do is think about going in a different month. The California Adventure Food and Wine Festival began in March and runs through most of April. Anaheim's spring weather is variable, but rain becomes less likely in April, and it can be dry and very pleasant. At the extremes, Anaheim's record low temperature was 30 F (-1 C), and its record high was 108 F (42 C). If you want to compare April weather to other months, check this guide to Disneyland weather and climate. Touringplans.com keeps a list of rides expected to close for refurbishment. But with lots of visitors expected, major closures are unlikely, although rides may close briefly for routine maintenance. Expect a full entertainment schedule and late park closing times for most of the month. California Adventure hours are often shorter. Check the official April hours up to 6 weeks in advance. The best way to decide what to wear is to check the weather forecast a few days ahead. Midday, Disneyland feels hotter than you might expect. It cools off fast at dark and if you're going to watch Fantasmic! or World of Color up close, you'll be thankful for a water repellent jacket. Layers work best, clothing-wise. Make the innermost layer one that you'd be comfortable in if it's a little hotter than the forecasted high. Cotton clothing can be comfortable, but if you want to go on water rides, fabrics that dry quickly are a better choice. You can also take a plastic poncho to keep your clothing dry. If the extras seem like too much to carry, you can rent a locker for just a couple of dollars. Bats Day in the Fun Park: In April or sometimes early May, this unofficial event draws a lot of visitors. It's a family-friendly affair, where people sometimes bring their kids. Most of them are locals who enjoy Goth and other dark-themed subcultures, but it also draws international visitors. Get more details and this year's date at Bats Day website. DapperDay: Late in April another unofficial event happens. For this one, visitors dress up in their cutest clothing to visit the park, often choosing retro outfits that visitors might have worn on opening day. You can find this year's date and discounted tickets for large groups on the Dapper Day website. After April 1, it's hard to get significant ticket discounts. To find a few ways to save, you can use the Disneyland discounts guide. Hotel availability will be low, and rates will be high until the end of the month after spring break ends.